LOS ANGELES -- Since launching in 2011, NASA's Juno spacecraft has been cruising toward the biggest planet in the solar system. On Monday, Juno is scheduled to perform a nail-biting move designed to enter orbit around Jupiter to explore its cloud-covered atmosphere and interior makeup. That's the total distance traveled from launch to arrival. Juno's journey wasn't a straight shot. Because the rocket that carried Juno wasn't powerful enough to boost it directly to Jupiter, it took a longer route. It looped around the inner solar system and then swung by Earth, using our planet as a gravity slingshot to hurtle toward the outer solar system. That's how close Juno will fly to Jupiter's cloud tops. It'll pass over the poles 37 times during the mission on a path that avoids the most intense radiation. That's how long the mission will last. Because Juno is in a harsh radiation environment, its delicate electronics are housed in a special titanium vault. 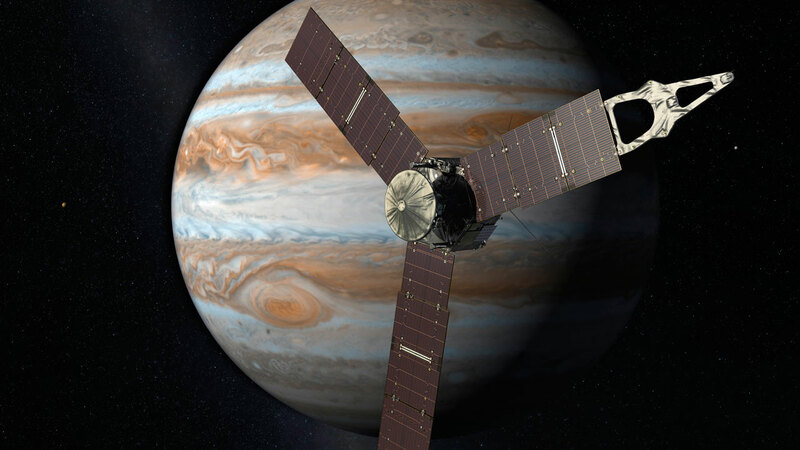 Eventually, Juno will succumb to the intense radiation and will be commanded to plunge into Jupiter's atmosphere to avoid any collision with the planet's moons.